I know I JUST blogged about Lunaversoul in June (check it out here) but when I saw these earrings and matching cuff bracelet, I had to showcase this Etsy shop again! Lunaversoul's designer, CJ (who is super cool by the way), is a master of creating pieces that are extremely funky and command attention. These two items are a part of her Santigold collection which includes a mixture of black and multi-colored metallic python-printed leather. How fabulous is that?! The earrings and cuff would look great separately but I don't think I could purchase one without the other. That's like peanut butter with no jelly, seriously. 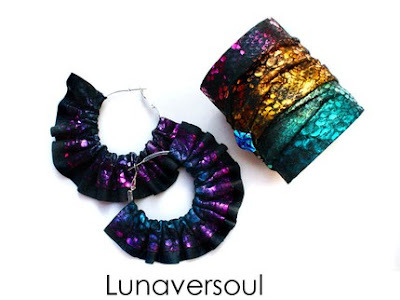 Check out the earrings and cuff at Lunaversoul's Etsy shop. And while you're there, go ahead and bookmark the shop's main page because I'm sure there will be more great things to come from CJ!